Halloween is almost here so It's time to get our best costumes, this elegant rigged mesh dress is perfect to seduce everyone. It's available at the in-world store and marketplace, the price is 69L$ and includes appliers for Gummies, Uberas, Tango, Phat Azz and Brazilia. 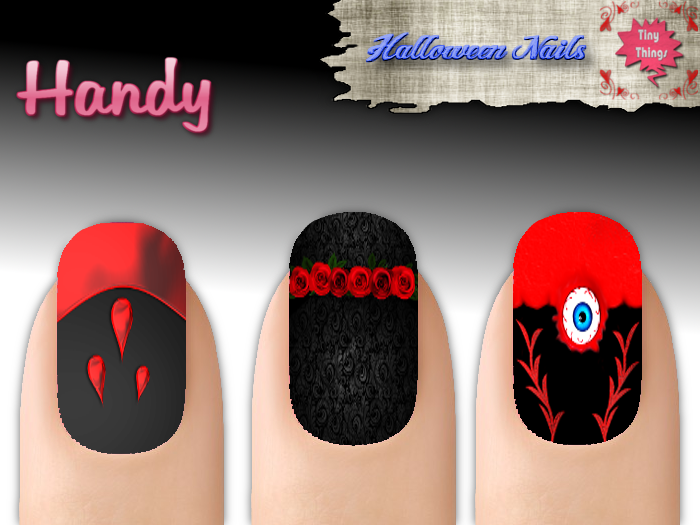 If you own the Handy hands, this three nail appliers are a must have for Halloween, the price is 10 L$ each one. Shape has been remodeled and fixed some scripts in the designers and converters kits. If you got the first version please use the redelivery terminal at the store (if you got them at in-world store), if you got them at marketplace, contact me to redeliver the updated version. If you tried the first demo, please try again the new demo. Some important fixes have been done, overall in the shape and other minor problems.